H&R Hot-Rod Project | H&R Special Springs, LP. Ford F-150 pickup trucks continue to be the number one selling vehicle in the U.S. and you can safely say that theirs is the greatest American automotive phenomenon—the new 2009 Ford F-150 is no exception. The newest addition to the Ford lineup has more model variations than ever before, promises more power and efficiency, and is looking to set a new standard in fulfilling driver needs and desires. Our team at H&R Special Springs decided it was the perfect canvas for us to demonstrate its opportunities for personalization. 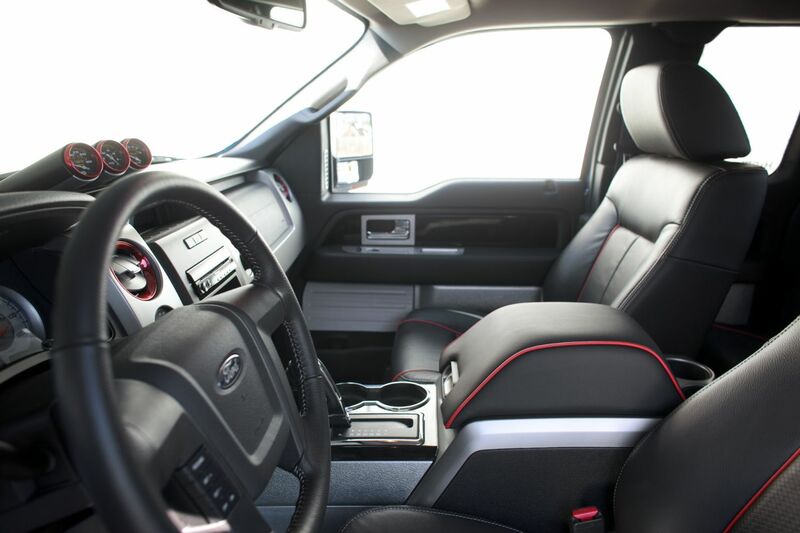 Our vision for the F-150 reflects its versatility. Ford says the F-150 is built for you, and we took them at their word to create a project vehicle that is our take on a classic American hot-rod truck—and, with some ready available aftermarket parts, we created a truck that is truly original and unique. First things first, suspension. 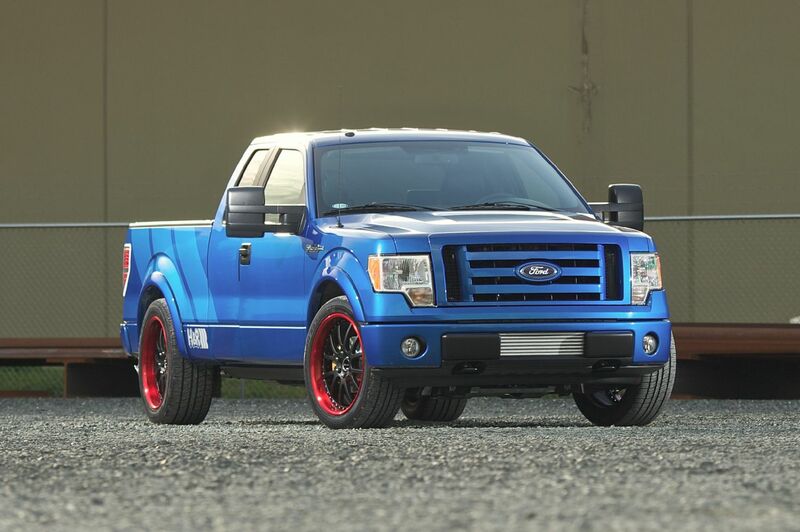 Though it is uncommon to lower a 4-wheel drive pickup truck, we did. 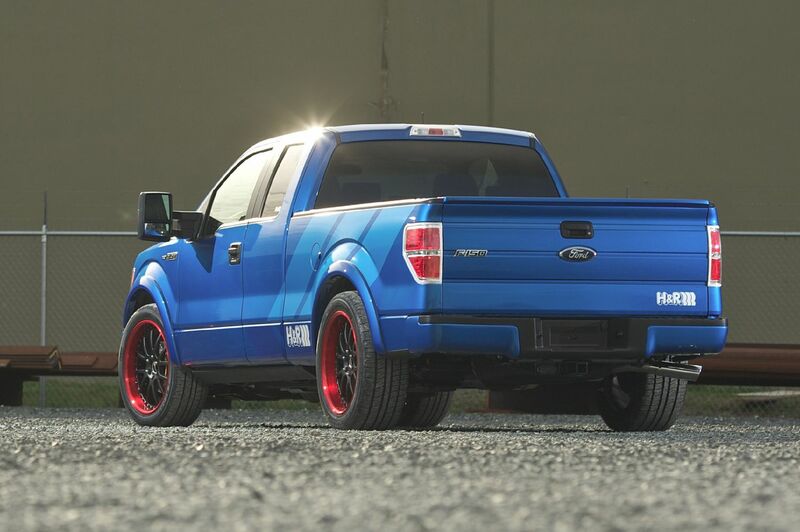 In keeping with our goal of creating a unique vehicle, we lowered the F-150 3 inches in the front and 4.5 inches in the rear using our H&R Sport Cup Kit prototype—improving handling and increasing ride comfort. 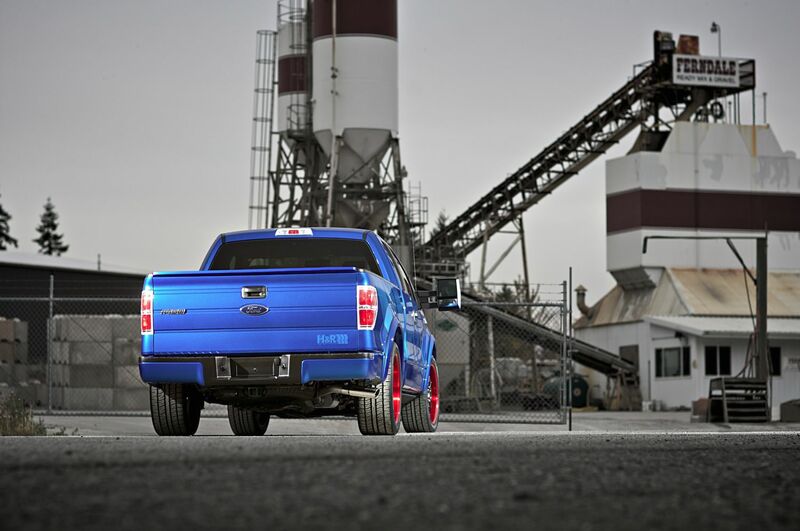 The F-150 has a perfect stance, and hauls in turns come rain or shine. In order to go fast, you must be able to brake fast. We have upgraded the rotors with slotted and drilled Baer DecelaRotors as they increase stopping power and have a dynamic visual appearance. Adding to our truck’s hot-rod theme, and borrowing from the 1970’s, we have painted the factory calipers gold. Now, throw on your safety glasses to protect your retinas from the awesome, custom built Forgeline VRP3 alloy wheels. 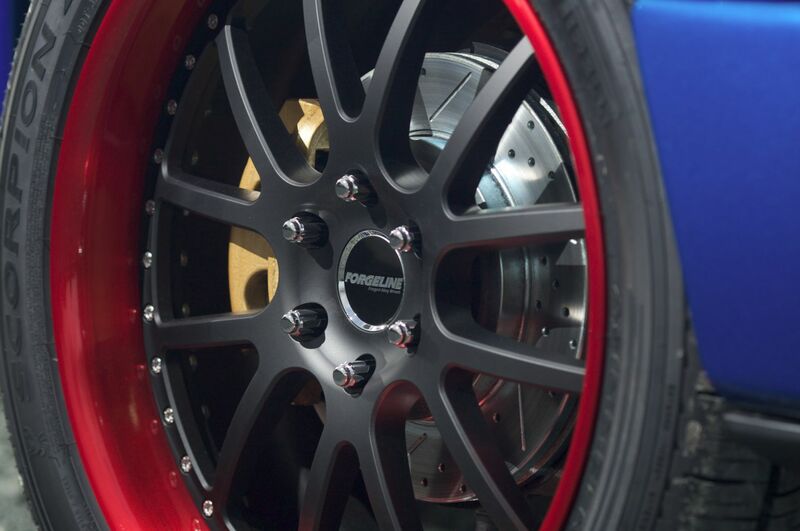 Forgeline has precision built the lightweight wheels to custom fit this project—with matte black centers and exclusive, transparent red outer rim finishes wrapped by some of the largest Pirelli Scorpion Zero Asimetrico tires available. This tire and wheel package is ready to rumble. 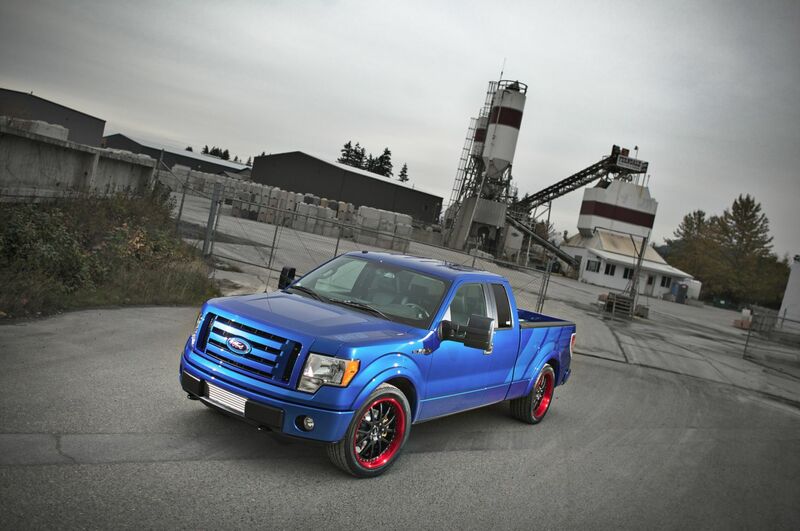 We cannot get enough them—and the vivid red perfectly compliments the vehicle’s Blue Flame exterior. Don’t give into sensory overload when the Blue Flame exterior paint and custom designed graphics wreck havoc on your processing abilities (more ram please!). Instead check out the StreetScene aerodynamic rear lip spoiler, which looks awesome. 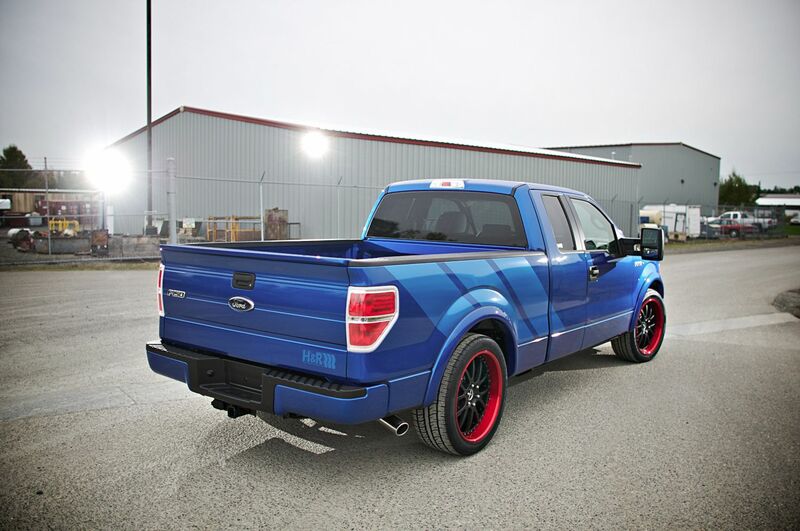 After you have let the full effect of our hot-rod’s Blue Flame exterior paint and custom graphics hit you, you’ll be able to notice our F-150’s AMP Research additions. We have installed the new AMP Research Bedstep at the rear and an AMP Research Power Step with LED lighting to allow easier access to the cab. We also added an AMP Research bed x-tender—the original bed x-tender—to allow for more usable space. Though you could spend hours taking in every detail of the F-150’s exterior, you won’t want to miss the interior enhancements. 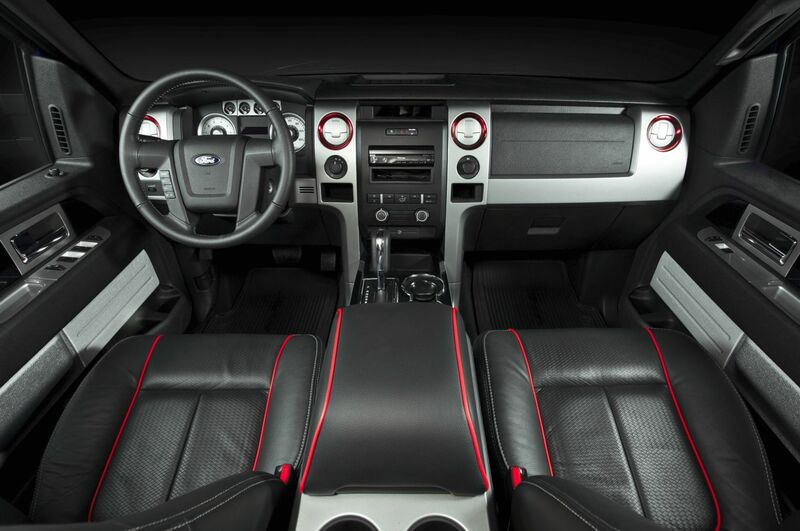 The custom black interior has been accented with red piping—which brings the styling cues of the red outer rim finish on the wheels, inside the cab. 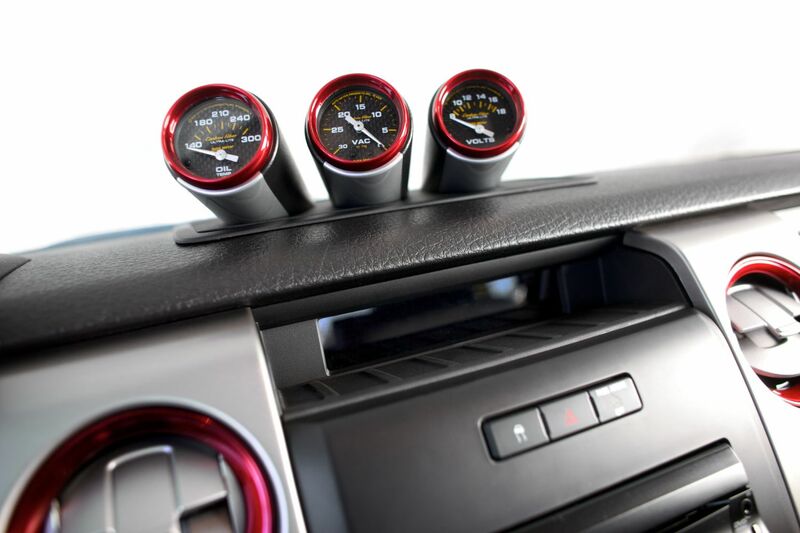 Maintaining this theme are the red air vents and a custom built Scosche dash bezel that accommodates a Pioneer head unit. 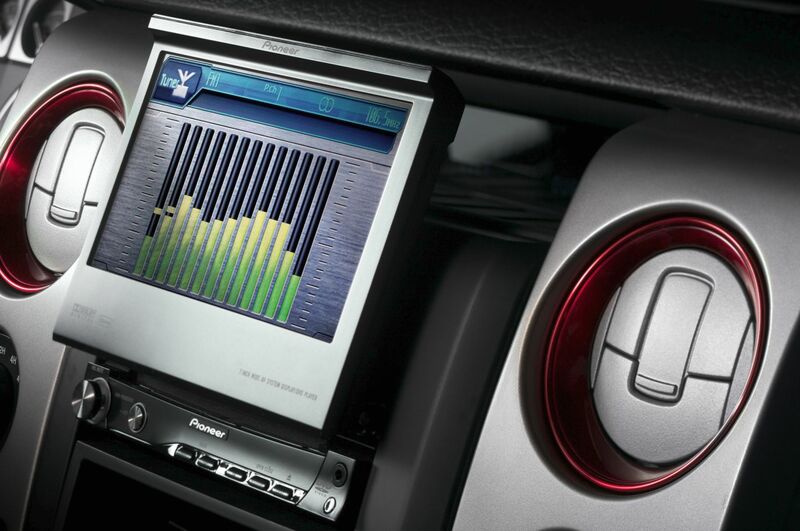 Check out the custom Pioneer audio system—including XM radio, custom-built sub woofer box, with 2 Pioneer amps—and Scosche audio accessories that continue to rock out H&R project vehicles. You won’t believe the sound quality coming from the custom fit Pioneer speakers and sub woofers—it transforms the cab into a concert hall. 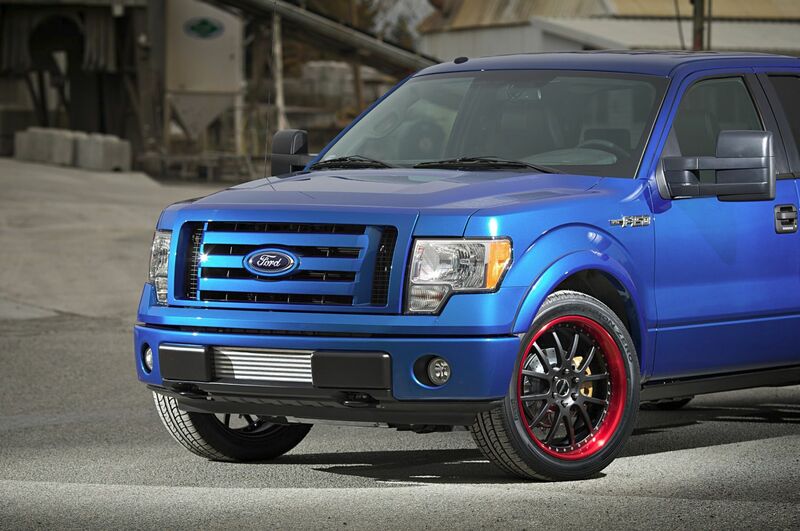 As we have mentioned, the new 2009 Ford F-150 has exceeded our expectations, once again. Its versatility, combined with its practicality and rich automotive heritage, make it impossible to ignore. 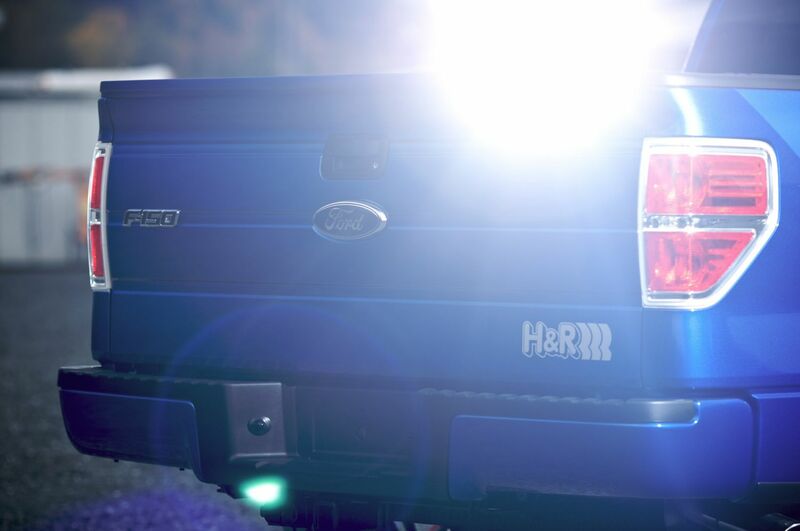 Whether attracting attention on Main Street or your favorite off-road path, the H&R Ford F-150 will stand out as an original and functional vehicle that offers great potential for matching individual style and performance preferences—a true American classic.